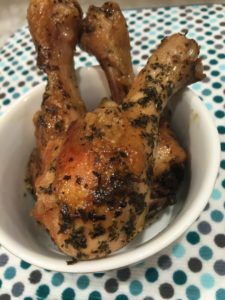 Drumsticks are always fun to eat! They offer an easy weeknight meal, and are great served cold in the lunchbox the next day. Arrange chicken legs in large cast iron pan, sprinkle olive oil over the top. Season generously with thyme, marjoram, sea salt, black pepper. Add white wine. Cover and place into 375 degree oven for about 40 minutes. Remove cover and bake drumsticks for additional 15 minutes, which will make them crispy.